A Better India, A Better World | Fourth Dimension Inc. This brings us to the question is there something like “chance” or “fortuitous event”? Indian seers and sages with a deeper spiritual vision perceived that what appears to be chance, fortune or fate are the outer results of unseen and invisible causes. They saw two major factors behind all events. First, at the highest level, it is the Divine Power and Wisdom which governs the world. Second, at a lower level, Law of Karma which determines the consequences of our actions. The environment in which we are placed, events we encounter and the experiences we go through in our present birth are the results of our past actions and what NRM says, the nature or quality of our responses to the “chance” or “fortuitous” events is one of the factors which will determine our future destiny. 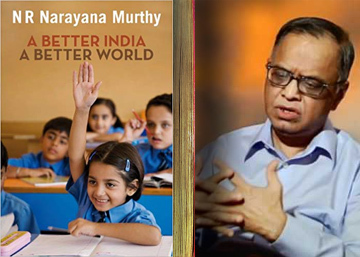 Coming back from the philosophical digression to the book under review, the main theme which recur constantly in NRM’s speeches and repeatedly emphasized as the key factors for building a better India and a better world are values, excellence, leadership, entrepreneurship, innovation implementation, giving back to the society. This book as a whole provides useful perspectives on a wide range of issues which can be of great help to people from all walks of life and in all stages in their career or life – from the student in the B-school and the young man or woman in the beginning of their career, to the senior professional, manager, administrator or politician.